Did you know that you are the average of the five people you spend the most time with? Or so Jim Rohn said and frankly, I consider it to be very true. We all know this to be a fact because when it comes to our kids, we will do anything to ensure they go to the right schools, we will even move house if it means that they are in the right catchment area for what we consider to be a great school. What stops us then from giving ourselves the same consideration? Yesterday, I put the statement above on the Facebook page (Ok so I have now made it into a picture but the message remains the same) and there was a lot of response to it. This made me realise that lots of people recognise there is an issue with the people they spend time with and yet lots of people do nothing to change the situation. What stops you from choosing your friends with care? Is it your fear – maybe you feel you have nothing to offer people you perceive to be ‘better’ than you. Maybe you do not know where to find these friends. Maybe you are afraid of letting go of the friends you have as it is all you have known and the unknown is pretty scary. Maybe you still do not realise the impact your friends are having on you. Whatever it is, think about it. Become aware of who you spend most of your time and question yourself – Is this relationship helping or hindering me? Now, you may not need to cut the friends off completely but you could limit your time with them and you could also be aware of what you take on board whilst with this friend. Listen out for the self-defeating language you can hear and immediately, find a way to refute it. Of course, the more you do that, the chances are, they may not want to spend time with you as they feel YOU have changed. And yes, you will have changed – that is the goal. Changing from the person you were to the person you truly are is certainly the goal. Recognising the things that hold you down, that hold you back, that is certainly the goal. So start to put yourself first in this respect because deep down inside, you know you are an eagle, not a chicken. 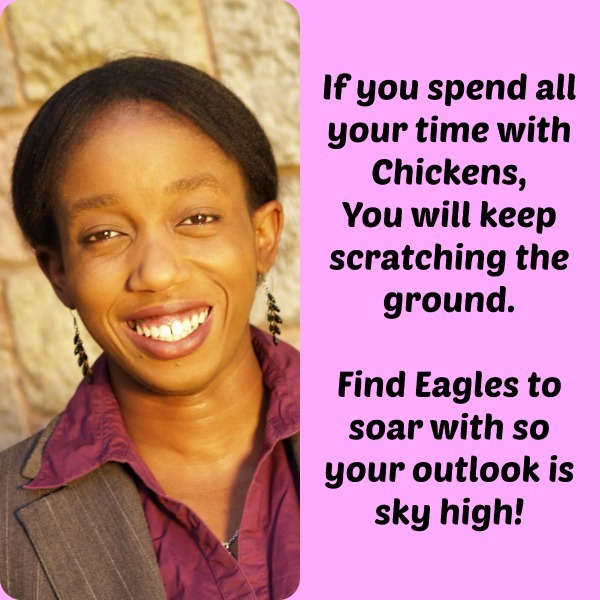 Find eagles to soar with, Find eagles that push you forward, Find eagles who are ready to walk away from comfort and move along into their best life. Go with them, lead them. It is time to change! Tomorrow, come and be a part of a call that will help you take the first steps towards living your best life. All you need to do is click on this link – RosemaryKnight.com/webinar and register for it. I will be there at 330pm BST, Will you? Come and hear how to move forward. Self Employment or Employment – Which one do you prefer?